Give someone the gift of a lifetime, a Tandem Skydive experience 200kph of pure adrenaline. Sydney Skydivers give vouchers are sent instantly by email and are valid for 3 years. The skydive must be completed prior to the vouchers expiry date. If you require a physical voucher please call our booking team after you receive your email voucher and we can mail our a physical voucher express post for $10 postage and handling. This voucher may used on a weekend for a Tandem Skydive. 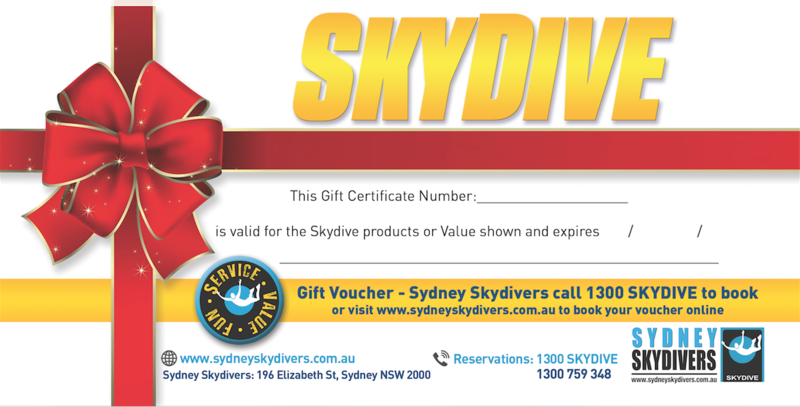 This Gift Voucher will redeem for the full value of a weekend skydive. The recipient will always be able to complete a Tandem Skydive on a weekend or mid week. If used mid week there is no refund on the value of the voucher. *see conditions on max weights surcharge applies over 95kg.